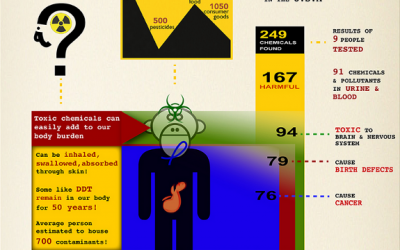 A new infographic called the Chemical Ape discussed just some of these chemicals and the impact they have. The United States in all its twisted glory is likely the most toxic with an estimated 70,000 such chemicals in commercial use, many of which are untested on humans so we don’t even know the effects. Modest estimates have suggested that we are exposed to more than 700,000 different toxic chemicals on a daily basis, and this doesn’t include the crazy poisons that GMO companies are pumping into the food supply. According to GlobalHealingCenter, it isn’t abnormal to be exposed to 2,100,000 toxins each and every day. Even research from the University of California shows how the average person is being exposed to cancerous levels of toxins like arsenic, dioxins, and DDE. These toxins aren’t only made available to our body, organs, blood, and cells when we eat and drink them, but also when we breathe them or simply come in contact with them. You can also take a detox bath, get regular exercise, and use a sauna to aid in the detox process. Don’t forget all of the radiation in the air, food, water, rain, etc. that comes from nuclear energy, nuclear meltdowns such as Chernobyl and Fukushima, and past atomic testing. The oceans are full of this radiation, too. A lot more information on this at the highly recommended site called ENENEWS. You have mistakenly named “chemicals” as “toxins.” Everything in the universe is a chemical. Everything. These are not necessarily toxic. There is really nothing you can eat, and certainly nothing you can add to bath water that will magically transport “toxins” outside the body. Honestly, besides this magical thinking, is there any other known mechanism people can equate this to? Can anyone name anything that can be applied to the skin that removes anything from organs? It makes no sense. As I went to close the tab for the infographic, I noticed something more. The bottom names a few vague sources of mysterious “toxins.” However, it first claims that table salt is dried at 1200 degrees Fahrenheit. So? The graphic claims that this changes sodium into sodium chloride. Wow. How embarrassing. The heat magically created another element out of thin air? the compound is created when sodium and chlorine share ionic bonds. Chlorine does not magically come into existence in the presence of heat. This is just the sort of embarrassing snafu people make when they have no basic understanding of chemistry or science in general. Does anyone past the third grade honestly not understand what sodium chloride is? Try tamarind, selenium, cilantro, beets, vit c and,broccoli sprouts along with sauna’s to detox any poisons that your body maybhave accumulated before you dismiss everything as nonsense. Your attitude is very non-sensical, lol..